Few adults can resist the blunt force power of unconditional love that children wield with impunity. Seeing the person you wish you were reflected in the eyes of a child is a uniquely disarming experience. Pierre (Hardy Krüger) is particularly susceptible to such charms; the traumatized war veteran feels alone even among friends and desperately needs another outsider to provide him the connection and validation that responsible adult society cannot. Enter almost-twelve-year-old Cybèle (Patricia Gozzi), a wide-eyed cherub who has just been abandoned at the local Catholic orphanage by her cowardly father. Pierre spies her at the train station and immediately begins stalking her, a disturbing set-up until we discover that he is just as wide-eyed and child-like as her and has simply identified her as a kindred spirit. It's a convenient conceit that isn't entirely convincing, but the relationship they strike up is. Every Sunday Pierre spirits Cybèle away from vigilant nuns (what other kind are there?) so they can play in the woods of Ville-d'Avray and swear eternal loyalty to each other. Cybèle solemnly counts out the years to determine that she will be eighteen when Pierre turns thirty-six at which point they can marry; until then they will just have to love each other as much as possible. For child and man-child, this love is as innocent and natural as can be. The neighbors who gradually begin to notice their unusual familiarity are somewhat more judgmental. 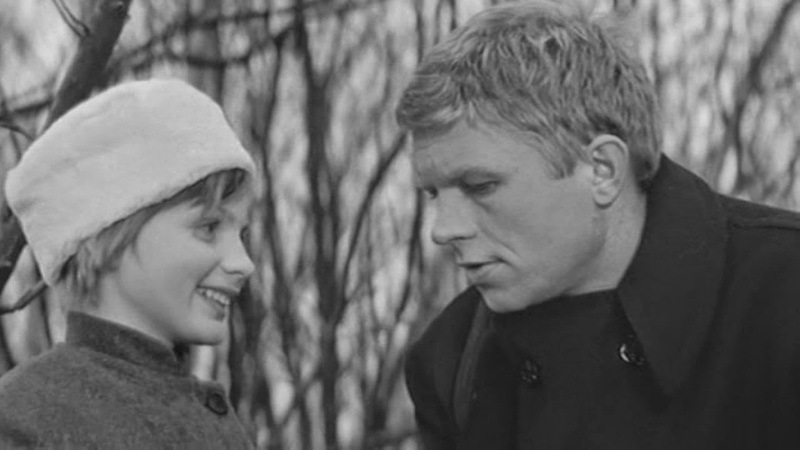 “Sundays and Cybèle” (1962), loosely adapted from a novel by Bernard Eschassériaux, was director Serge Bourguignon's first feature after directing several short documentaries. It was a hit with American critics (somewhat less so in France) who expressed few concerns about the potentially disturbing implications of a clandestine relationship between an adult male and a little girl, obviously viewing their intimacy as purely as the protagonists and, so it seems, the director do. Gozzi turns in one of the most winning performances by any child actor, her expressive eyes and thoughtful demeanor conveying sincerity even when she sometimes speaks wisdom far beyond her years. Krüger, the only established star in the cast, seems rather studied in contrast to his co-star's naturalism, perhaps working too hard to find techniques to express his inner trauma, but he balances warmth, naivete, and just a touch of menace to great effect. The film is is at its best when the two wander alone in an idyllic state captured poignantly by the graceful mobile camera of veteran Henri Decaë. 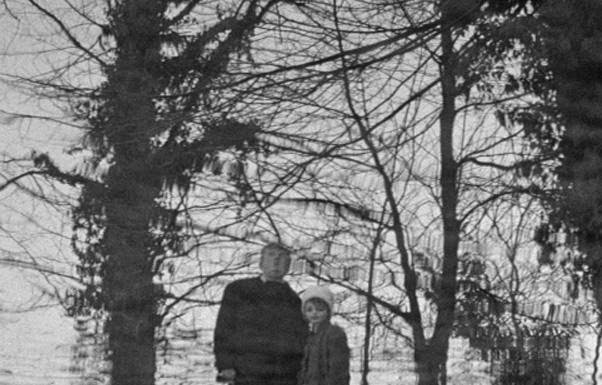 The camera frolics along with the two wounded souls through the bare trees and along the gloomy lake, their little sanctuary in the middle of a “civilized” society poised to destroy it all at any moment. This is a black-and-white world permanently shrouded by clouds and painted in various tones of gray with little in the way of sharp contrast. Perhaps it's meant to look as dreamy as a child might perceive it or as hazy as a PTSD-sufferer might. At times, the mise-en-scène is quite heavy-handed (lights that flick off automatically and must be repeatedly turned back on, an awkwardly staged opening sequence in Pierre's fighter jet) and the story's resolution seems rather pat and overwrought, all of which likely explains why the film cruised to a Foreign Language Film Oscar. Still, the intense and moving relationship between Pierre and Cybèle is unforgettable and will linger in the memory long after some of the film's less accomplished aspects fade. The film is presented in its original 2.35:1 aspect ratio. Much of the movie occurs under overcast skies or at night, and this 1080p transfer provides the essential image detail that would probably get partially blurred out on a typical SD release. Black-and-white contrast isn't all that sharp but isn't supposed to be. The transfer is clean with no obvious signs of damage. The linear PCM mono audio mix is typically efficient and distortion-free. The audio design sounds a bit hollow at times but in a way that evokes the hermetic world the two leads try their best to live in. The Maurice Jarre soundtrack is quiet and unobtrusive and sounds fine here. Optional English subtitles support the French audio. Criterion has included three new interviews, all recorded in 2014. Director Serge Bourguignon (26 min.) discusses pre-production (he originally wanted Steve McQueen for the lead) and shooting. Patricia Gozzi (11 min.) talks about how she broke into the film business and her relationship with her co-star. Hardy Krüger (23 min.) speaks quite warmly about what he considers one of his finest roles. The disc also includes the short film “Le sourire” (“The Smile,” 1960, 22 min. ), a documentary about a very young Buddhist monk which is very pretty but feels like an outdated exercise in exoticism; such is the fate of any similar film over fifty years though. The movie won Bourguignon the Palme d'Or for best short film at Cannes. A separate introduction (7 min.) by the director is also available. We also get a Trailer (2 min. ), the audio of which consists mostly of a lengthy excerpt from a gushing review by New York Times critic Bosley Crowther. The slim fold-out booklet includes an essay by film scholar Ginette Vincendeau. It's unusually measured for an accompanying essay, expressing reservations about how Cybèle is structured as a “mini-adult” but still praising the film's stronger aspects. Serge Bourguignon would never match the success of his debut feature, missing out on his pursuit of a Hollywood career and shooting his last film in 1967. 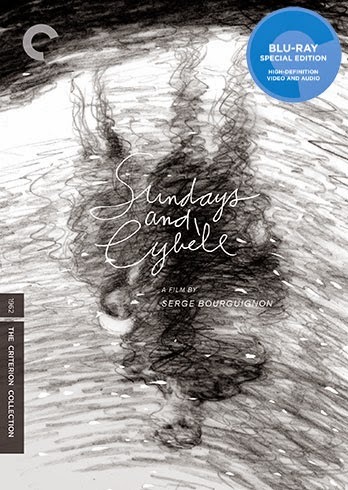 However, “Sundays and Cybèle” was enough to define a legacy, and this Criterion release does it justice both in terms of the high-def transfer and the extras included.